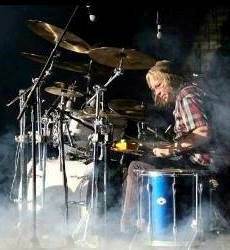 Many drummers are faced with the burden of back pain and fatigue as they enjoy their favorite hobby… playing drum set. It was the desire to reduce that pain and fatigue that birthed the creation of the Carmichael Drum Throne. The purpose of the throne is to reduce pressure to the tailbone, spine, and the prostate while encouraging good sitting posture.” These benefits alone greatly reduce fatigue and increase energy; allowing the user to rehearse, record and gig for longer periods of time and with much more comfort” as stated by the throne’s creator Dan Carmichael. After testing the throne for several weeks, I found myself enjoying all the benefits that the throne had to offer; especially the reduced pressure to my tailbone and spine. Both my private students and I enjoyed the reduced fatigued during lessons and performances, and were very satisfied with the comfort and quality of the throne. The throne is offered in a variety of options to conveniently meet the needs of users with, or without an existing tripod base. The company stated that since many drummers have an existing base, they are pleased to offer the seat equipped with all the necessary holes and threading to be interchangeable with the commonly used Roc-n-Soc seat mounts. The Carmichael Throne Company also offers two great options for people that do not have existing hardware. These two options include the seat with a heavy duty Roc-n-Soc tripod base featuring a manual spindle, or the seat with the Roc-n-Soc Nitro Stand. In addition to the mounting options, the throne is also equipped with the necessary threading to install the Roc-n-Soc Back Rest. To see the installation process and all the features of the Carmichael Throne, be sure to watch our product close-up video below.